Hello GOOD people, yours truly is currently listening to Tyler Woods' (not the golf player) 'Stayed Away Too Long', as I type this! OMG, did I just reveal the first track of the EP in my first sentence? 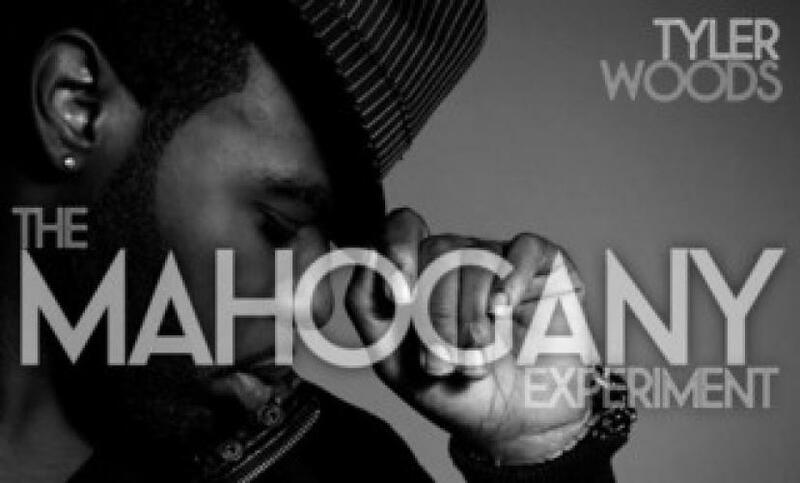 Not to worry you can listen too in a few minutes.When I got 'The Mahogany Experiment' on my desk, my gut said to me (and I quote), "you aint gonna like this" and considering the fact that I prefer Hip-Hop to any other genre of music, you can't blame the poor gut now can you? How wrong... I repeat HOW WRONG was I? I didn't just like 'The Mahogany Experiment', iLOVED IT! Tyler Woods (real name no gimmicks) is an R&B singer/songwriter/multi-instrumentalist and is already turing into a household name thanks to his songwriting skills, good looks and a voice that can melt a heart faster than butter on a hot sunny day. On this EP, Woods joins forces with the veteran uber-talented producer behind some of the soulful sounds of the likes of Little Brother, MURS, Pete Rock and Erykah Badu, who also doubles as the owner of the record label that Tyler is signed to, Jamla Records... By the way, I call Tyler by his first name because I feel a connection with him after listening to this EP as you will too, you might even think you attended the same college or something but alas I digress... The producer I was referring to is none other than the incomparable 9th wonder but you already knew that. Did I forget to mention that Tyler Woods is from North Carolina - the home of 9th Wonder and some of the most burgeoning artists such as J. Cole, Yahzarah, Darien Brockington and amongst others!There must be something in the water right? Well, without any further 'ado', lets PLUG the music! As we move further into the EP, Tyler steps up the tempo as 9th wonder comes through with an infectiously head-bopping Hip-Hop instrumentation, and if you only knew who he calls upon to 'put the knife in' on this next track? None other than Styles P (one third of veteran Hip-Hop group, the LOX) and he comes in to do what only "The Ghost" can do - lay a couple crispy clean rap verses on this truly Hip-Hop influenced track which still manages to remain R&B enough for Tyler to do his thing. 'Only Knew' sees Tyler lament about how he misses a lover with Styles P making the song more interesting as his opening verse gives the listener food for thought. "but she is gone with the wind/or gone with her friends/ but i'm like damn!! /i hope she aint gone with a MAN"?! Tyler also gives a teary but heartfelt rendition about the reasons why he misses her and how he wishes she "only knew" and I seriously can relate to Tyler on this song, especially the line; "kisses for no reasons". I particularly like the way these two artists share the verses on this track so before you make the same mistake and start screaming "had I known" or is it "if you only knew", listen and learn from Mr. Woods and Styles P below. 'The Mahogany Experiment' is a very very good EP and what makes the release perfect is the timing - February, the month of love. The EP is better than a lot of R&B albums out there and my only major problem was in deciding the three songs I wanted to share out of the 14-track EP! The stellar guest appearances include Heather Victoria, Big Remo, Styles P and wait for it ....still waiting?! Talib Kweli (Track 8 - Ms. Diva is a must listen) as Tyler Woods makes an outstanding effort to appeal to all... Whatever genre of music you are in to, be it Rap, Hip-Hop or R&B, 'The Mahogany Experiment' is a classic example of all this genres coming together to make sweet love! Oops, sorry I meant sweet music... DOWNLOAD!! and play, judge plus jury... but dont forget to thank me later. #PS If you download this EP and you dont like it, just send me your postcode and I will send you a dozen fresh roses for wasting your time although I doubt that I'll have to! i love the 3rd song. 9th wonder? Sign me up! One of my favorite producers, hands down. The lyrics are great, too.Solid tracks. styles p is good...nice review,keep it up guys.